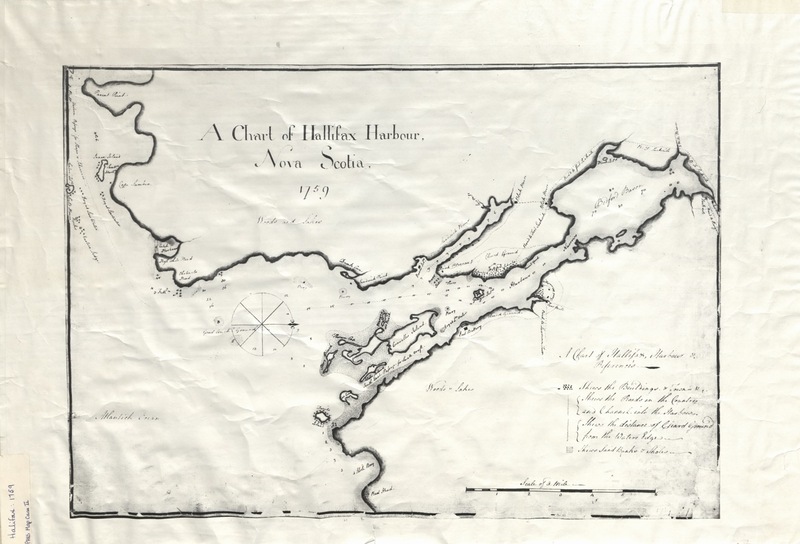 On the two Moses Harris Maps of 1749 (previously mentioned), there is a point of land across from the Halifax Peninsula on the Dartmouth shore, called Stags Point. Perhaps this references the animals of the deer family that used to be common within the city limits. As the walls of the new city were erected, the hooves of moose and caribou would have silently passed through the forest away from the construction. By the early 19th century, the land in and around the city had been completely cleared for farming and settlement, thus quickly exiling its hoofed mammals and other animals from the peninsula. Following their departure, Haligonians interacted with this wildlife via the sport hunt. 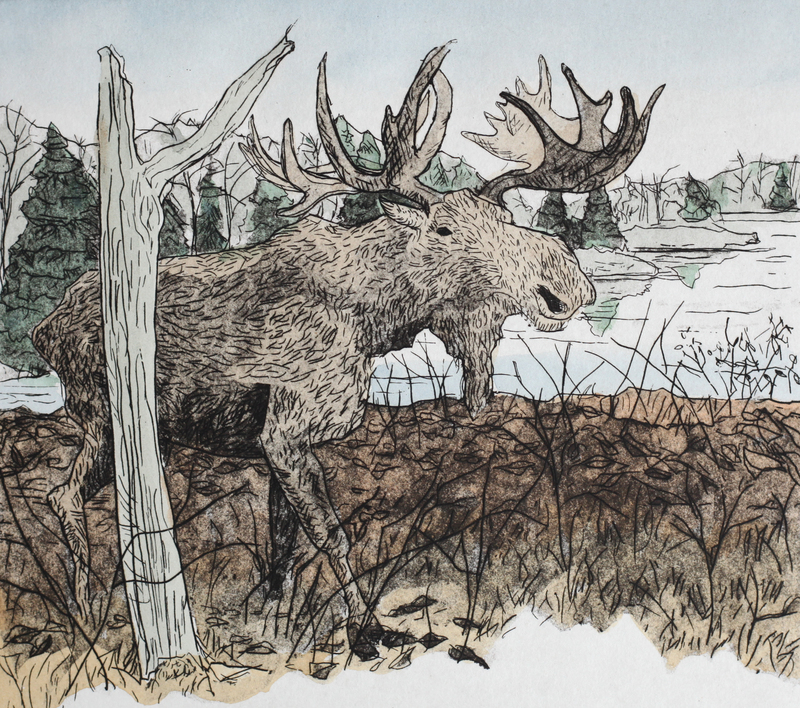 Etching with watercolor, drawn from the moose specimen at the Nova Scotia Museum of Natural History, 2013. -Donald Dodds, Challenge and Response: A History of Wildlife and Wildlife Management in Nova Scotia. (Nova Scotia: Province of Nova Scotia, Department of Natural Resources, 1993) 29. And so, laws were put into place to protect moose and caribou, as well as other wildlife deemed “useful”. As Donald Dodds outlines in his book Challenge and Response, 1856 saw the first closed season for moose hunting. The moose season was also closed between 1874 and 1877. 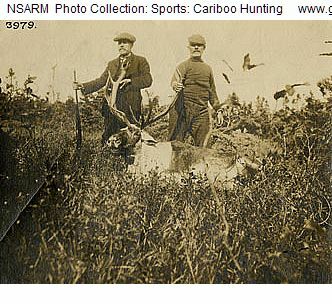 In 1894, hunters were not permitted to claim moose or caribou for a three-year period. The beaver, otter, and other animals valued for their fur were also protected in a closed season in 1862. The beaver, who’s colonies around Halifax had been almost entirely wiped out from the fur trade, were protected again in 1874 (for a three-year closed season), and again in 1894. 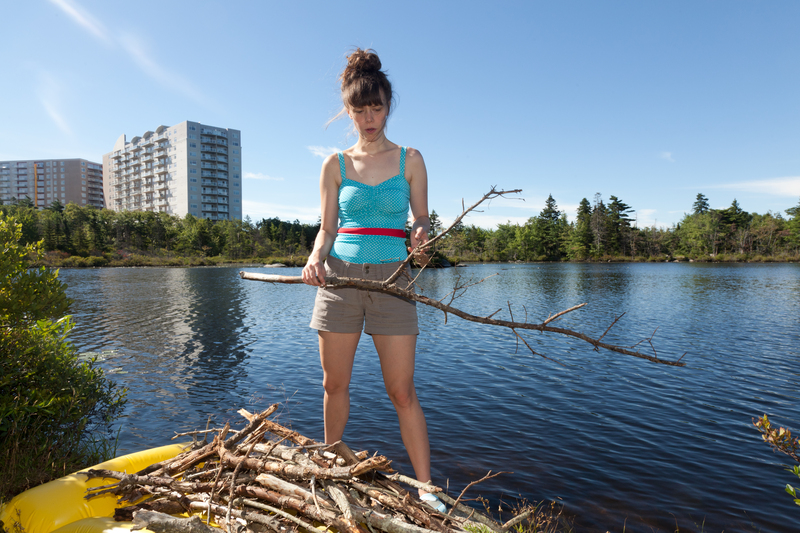 A shift is evident here among the early Haligonians and Nova Scotians of European descent— it seems they are aware for this first time of the fragility of the New World forest and its inhabitants, propelling a budding desire to protect them. Nevertheless, this comprehension was reserved for those species that could be considered game, or materially beneficial to the colony. Alongside new protection laws, there were bounties placed on predatory species such as the wolf, the lynx, the cougar, and the fox. The wolf is now extinct in Nova Scotia. The cougar and the lynx are now rare, but they protected from hunters by law. Actually, there have been no confirmed sighting of the cougar in recent years, and it is unclear whether or not it still resides in this province. 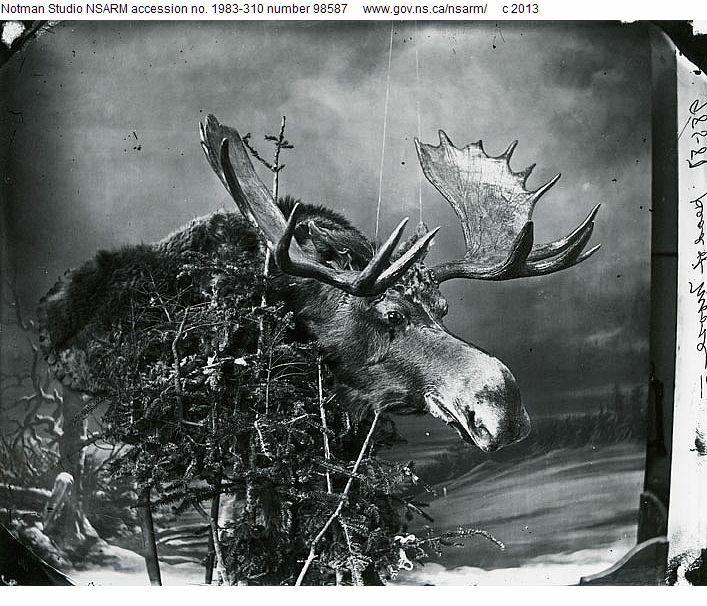 Photograph of dead Rangifer tarandus caribou (Kerr), Woodland Caribou. September 23, 1912. Courtesy of the Nova Scotia Archives. With an evident loss of caribou and moose, the province decided to introduce the white-tailed deer as a replacement for hunters. Distributed across the province, some of these were released near Halifax, and several may have come from the grounds of the naturalist and ornithologist Andrew Downs (1811— 1892), who bred them in captivity in Dutch Village. His property lay near where the Armdale Rotary sits today. In fact, Downs was a celebrated naturalist and master taxidermist. His work won medals in world fairs such as the London Exhibition (1851 & 1862), the Dublin Exhibition (1865), and the Paris Exhibition (1867). 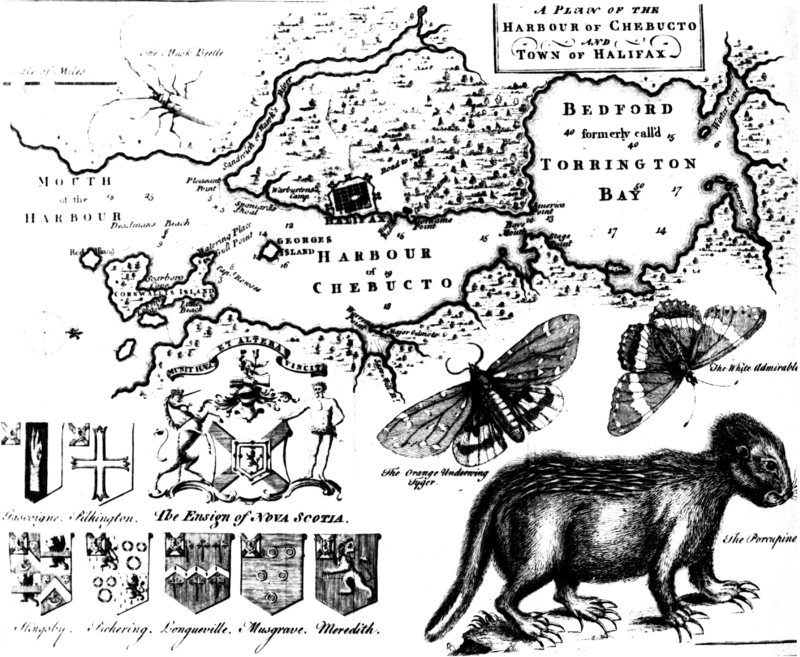 Halifax’s wildlife was being showcased throughout the old world. Over the course of his life, Downs estimated that he mounted over eight hundred moose heads. He prepared and delivered live and stuffed specimens to sovereigns, museums, and zoological gardens throughout Europe. Thus, Halifax’s nearby wildlife found itself taken dead or alive and transported across land and ocean to rest in new habitats. At the time of his death, Downs was considered the best naturalist the province had ever had. Unfortunately, the attempts to introduce white-tailed deer to the province had disastrous affects on the moose and caribou populations, as they spread disease (deer nematode) which attacked the brains of the animals in the already weakening herds. Moose did not perish entirely, although their numbers are greatly reduced. Caribou are now extinct in Nova Scotia. Courtesy of Nova Scotia Archives, Halifax, NS. This image was taken in the Notman photo studio, in Halifax. There is no date for this image, but the studio operated in the city between 1869 to 1920. Although I am not sure who mounted this moose head, it is a reminder that Haligonians were conscious of the wilderness in their province- hundreds of such examples of taxidermy would have adorned the homes of city dwellers. In a way, even when the wildlife left the city limits, citizens found a way to bring it back and to continue living alongside it. 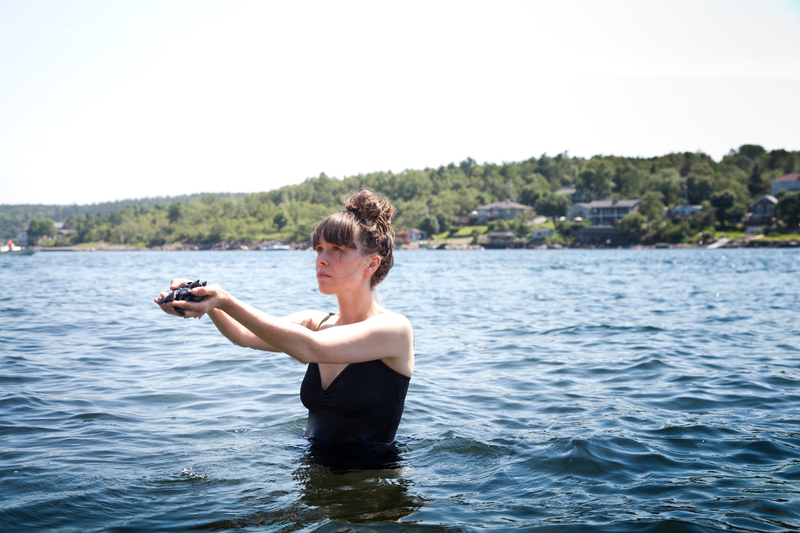 Although this was filmed in Digby, the footage now lies tucked away in rows of shelving at the archives, on the corner of Robie Street and University Avenue. Like Downs’ specimens, so too have these beavers traveled. I’ve noted in this section of Moses Harris’ map that the Northwest Arm was, in 1749, called Hawks River. This indicates that it belonged to the hawks, which I assume were plentiful in that area. Plentiful hawks would equate to plentiful fish, small mammals and smaller birds. I have never seen a river with so many hawks that it would be called “Hawks River”. One does not often encounter hawks in the city today. Early settlers exterminated many of these birds, which posed a threat to their poultry. 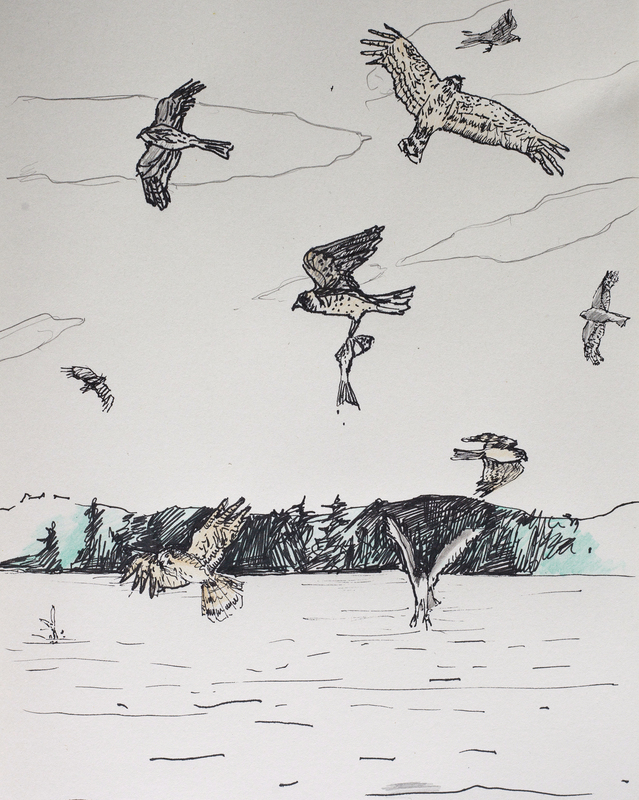 As the city grew, the wooded habitat shrank, and most of these hawks have now left Halifax. Hawk’s River was later known as Sandwich River, and then the Northwest Arm. Northern Hawk Owl: Halifax’s ornithologists of the mid 19th century recorded that these birds were at one time common. But by the end of that century, naturalists Downs and Piers both considered this owl as rare in Halifax and the province. Fifteen of these birds were seen around the city in 1913. Eskimo Curlew: Considered formerly common, there have been no recent sightings of this bird. A mounted specimen was prepared by Andrew Downs and taken to the new Provincial Museum in 1846. Naturalist Piers saw a specimen of this bird for sale at the Halifax Market in 1897. The Wood Duck: This animal was hunted by Early settlers for the purpose of stuffing and mounting for home decor. The Labrador Duck: This bird is now extinct, although it was at one time common along the NS coasts (which I imagine would include Halifax). The only remaining specimen of this bird in Canada was presented by the Halifax Naturalist Andrew Downs to Dalhousie University. It is now on loan to the National Museum. Several other specimens surfaced in Halifax during the latter part of the the 19th century. The Great Auck: It is probable that this bird would have lived along the coastline of Halifax, but it has been extinct for many years. A flightless bird, it was easy prey to hunters. The last known Great Aucks were killed in Iceland in 1844. 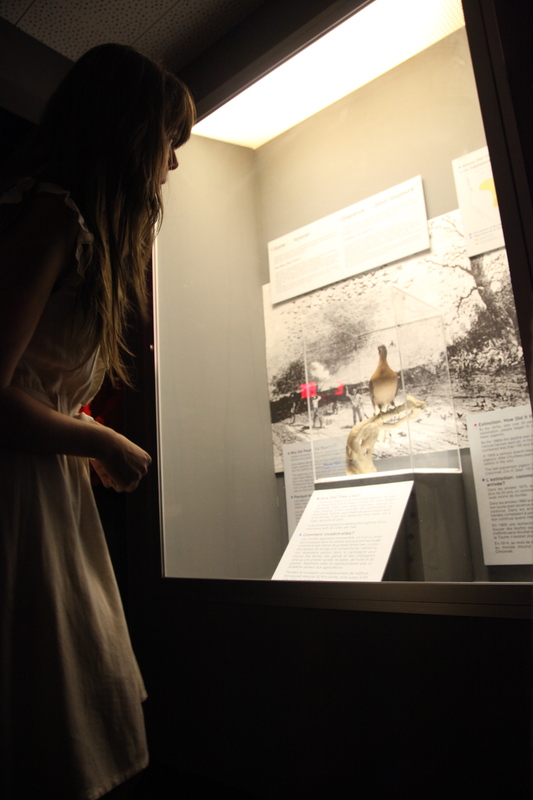 Singing a lullaby to the passenger pigeon at the Nova Scotia Museum of Natural History (Nocturne, 2012). Photo by Leigh Kirkpatrick. Actually, the NS Museum of Natural History has a Passenger Pigeon in its collection, and it will soon be celebrating it’s 100th birthday. Last Fall, I sang the specimen a lullaby. While Halifax’s early residents purposefully killed some birds to protect resources (the hawks, for example), and hunted others, contributing to their extinction (such as the passenger pigeon), other times, species of birds were introduced to the area, and set free. The Pheasant was introduced to Nova Scotia in 1856, and as the effort failed, early naturalists tried again in 1935 with more success. The Gray Partridge was introduced in 1926, and the Willow Ptarmigan in 1933. While this is not a definitive list, I mention the above because they were released in sites that bordered the city of Halifax. The Brown Pelican is another example: each one of these birds seen in Nova Scotia was taken, until 1924. 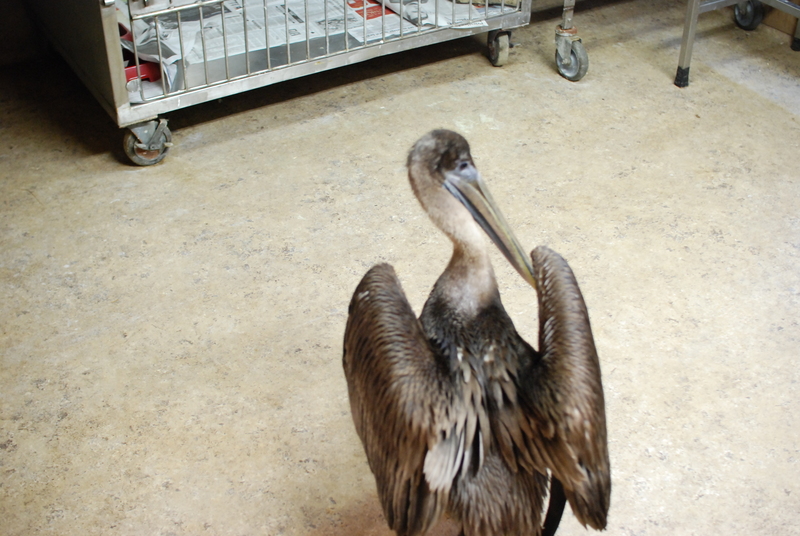 There was recently a pelican that found itself injured and stranded in HRM in 2010. Contrary to the old practice, this bird was brought to Hope For Wildlife— a wildlife rehabilitation center outside of Dartmouth— where it was nurtured back to health and returned to its home. I went to visit him during his stay. Halifax’s history with hawks and other aviary species seems emotionally wrought- early settlers either loved the birds so much that they needed to have them for their own, or they hated them and sought to exterminate them. Meanwhile there are more predictable relationships between hunter and prey- the species described above and others not mentioned provided nourishment and monetary value to Halifax’s residents. 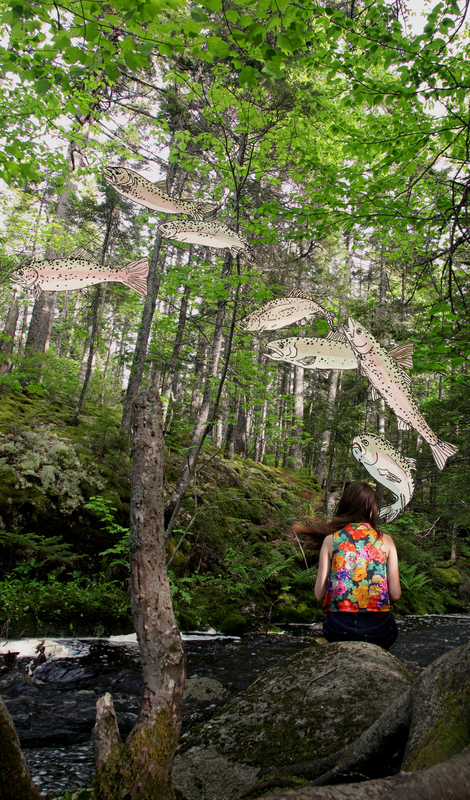 Haligonians also desired certain species, which were subsequently incorporated into the ecosystem. Today, birds are rarely killed in the city; they are observed, noted, and if necessary, rehabilitated. 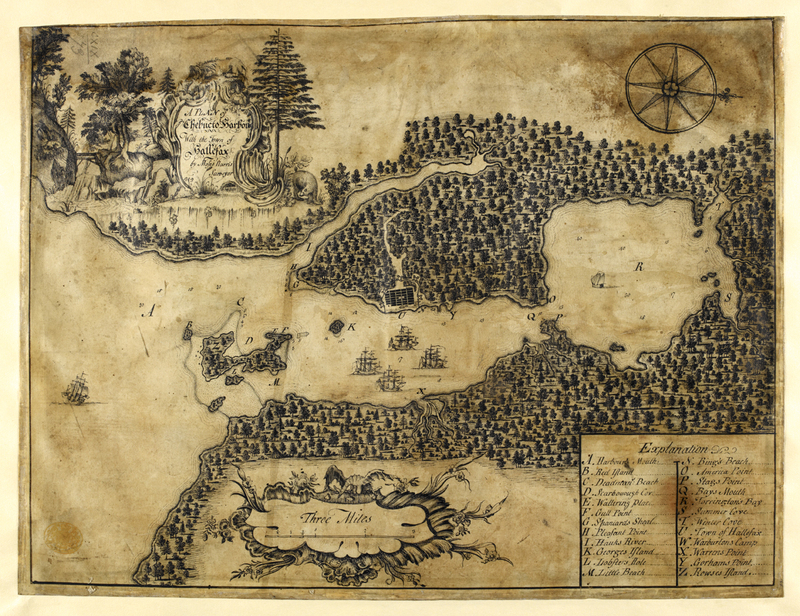 I have found the most mysterious and beautiful map of Halifax, created in 1749, by the surveyor Moses Harris. It depicts the hinterland that covered the peninsula and beyond, showing thick and diverse vegetation, rocky hillsides, waterways, and a small waterfall. At the top right corner is a bear walking out of the bulrushes, and what appears to be a lion or a wildcat perched on a rocky ledge. Farther down the page is a dragon— indicative of other fearsome creatures that lurked in the dense trees. I am not convinced that there were dragons living in this ancient ecosystem, but perhaps this points to the fear that early settlers felt from the forest that surrounded them— it would have seemed huge and foreign— completely unknown. 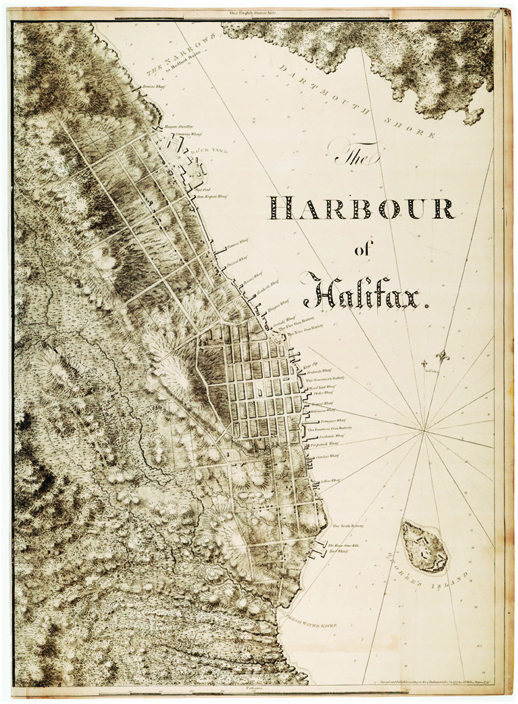 This map was never published, as it did not paint a favorable picture of life in the new colony; but, I have stumbled upon another map created by Harris in the same year, which was published in Britain to inform potential new settlers about Halifax. It offers a tamer depiction of the area’s wildlife with detailed drawings of a porcupine, a beetle, and a butterfly. 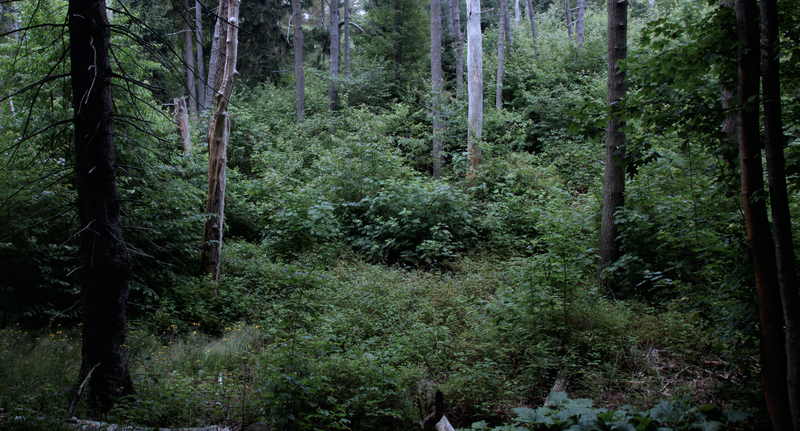 It is also evident that the trees are less dense, and that this map would have appeared less ominous. This image is more widely known; in fact, the Nova Scotia Legislature has an original color version in its collection— and so an ephemeral fragment of the former forest still resides in the heart of this contemporary city. I am not sure which of these two maps is more accurate. But Moses Harris is perhaps Halifax’s first Naturalist. Note: I first learned of these maps in the article “An Empire on Paper: The Founding of Halifax and Conceptions of Imperial Space, 1744-55”, written by Jeffers Lennox, and published in The Canadian Historical Review, 88, no. 3 (2007): 373-412. The wildlife of Point Pleasant Park is necessarily active during the day, and the animals are surrounded by bustling moving people and dogs from dawn to dusk. As a little girl, nothing calmed me down at the end of the day like a story read to me by my mother and so, I have decided to perform this same bedtime ritual for these animals. On July 25th and July 31st at 8:30pm, and beginning at the Tower Road parking lot, we will walk through the park, stopping at areas where urban wildlife is often seen. Chosen from classic children’s literature, I will read bedtime stories to the animals— stories that feature Point Pleasant’s wildlife as protagonists. Anyone is welcome to join in to be read to, along with the animals. -Mike Parker, Guides of the North Woods. Halifax, NS: Nimbus Publishing Limited, 2004) 2. 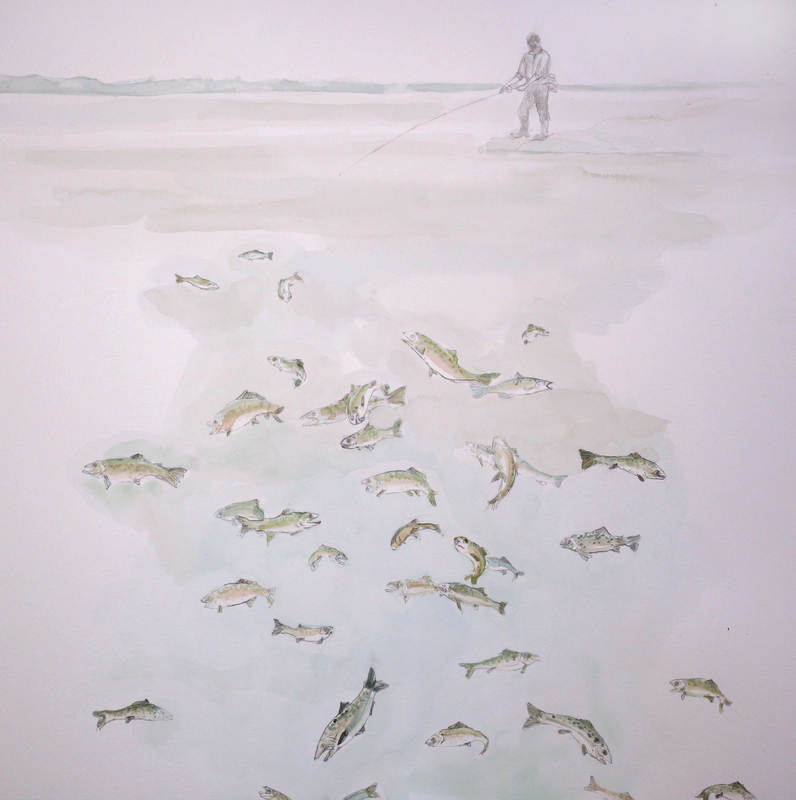 I was visiting Long Lake the other day with Woods and Lakes Society, and I was happy to see fish jumping in the water; I even made a remark about it in my notepad: I also came across a contemporary sportsman; he was fishing and I decided to interrupt him to ask what species were in the lake. He said there were trout and bass. On the hike home, I noticed another sportsman fishing. So after all these years, there are still trout in the city, but clearly not as many as before— neither fisherman was getting any bites. Courtesy of the National Maritime Museum, Greenwich, London. 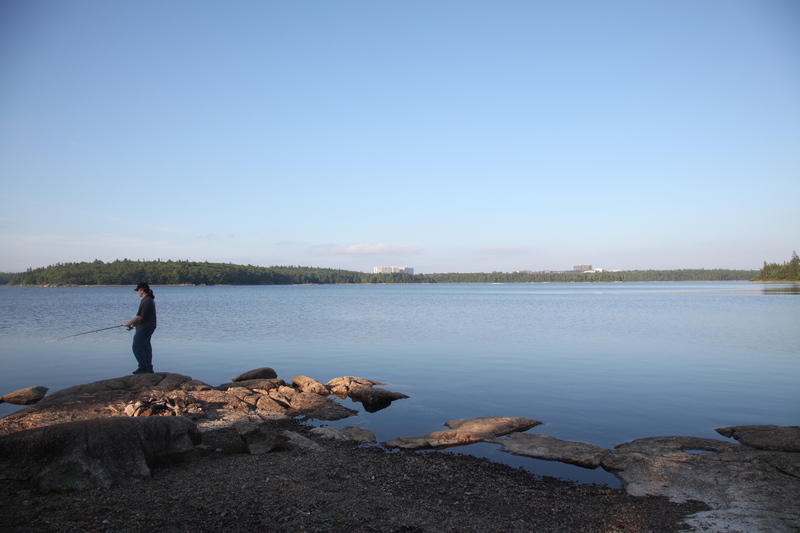 It demonstrates how close the city was to an untouched wilderness, filled with woods and lakes. The Harbour of Halifax, by Joseph Frederick Wallet Des Barres, 1777. Courtesy of the National Maritime Museum, Greenwich, London. 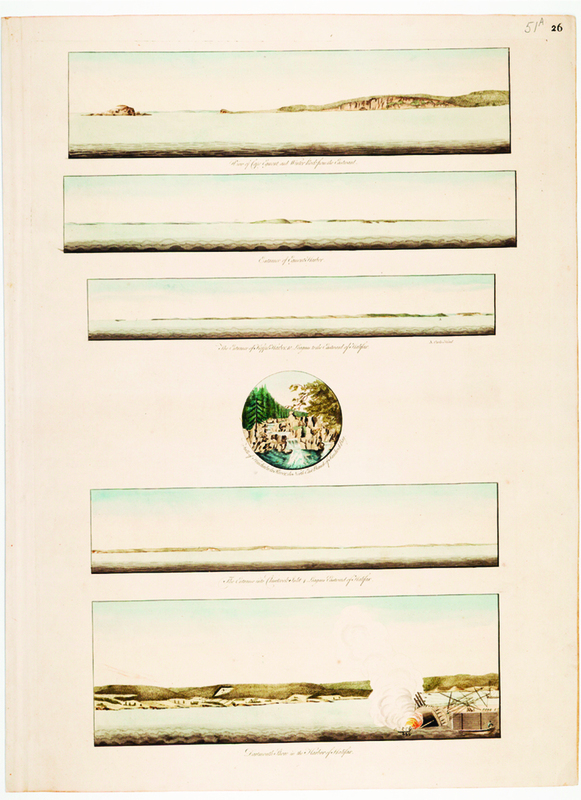 These etchings are images of the coastline around Halifax, drawn from the decks of ships passing by. 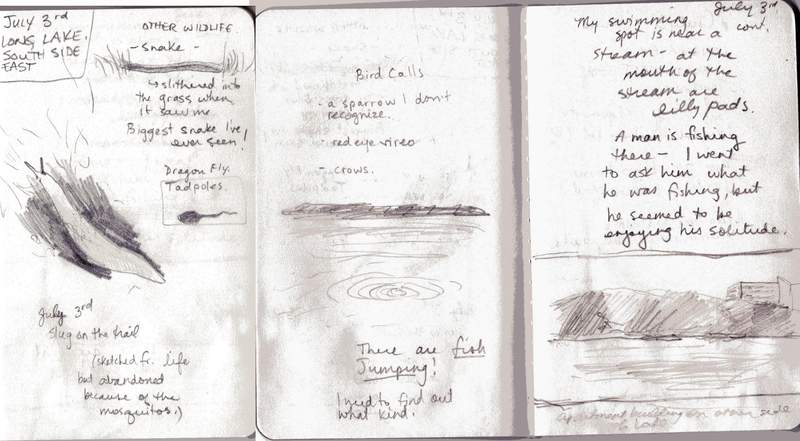 And so here are more clues about what the hinterland would have been like. Actually, the waterways give some sort of indication of the wildlife that would have been present; there must have been fish swimming through the city— trout perhaps? Salmon? What animals bent to drink from these cool waters, or nested beside the riverbanks? I have come across this map from the year 1759. Created only 10 years after the drawing in my previous post, according to this image nearly half of the peninsula had already been cleared. 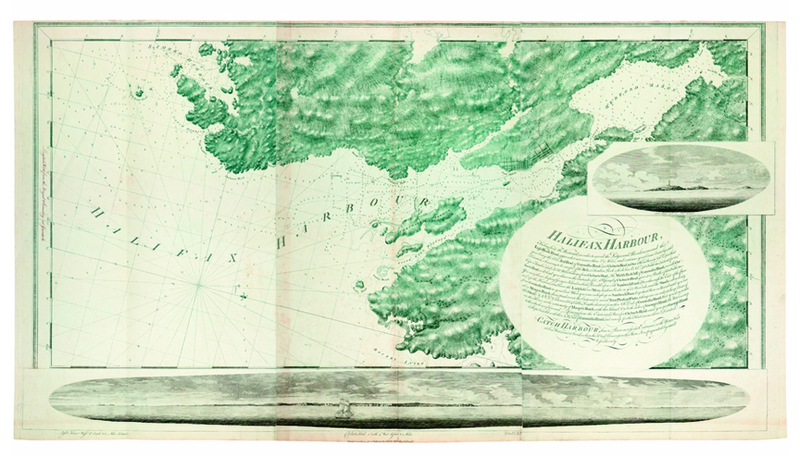 This early nautical chart also gives some indication of the terrain around the peninsula, and thus quite possibly the land that was being leveled: woods and lakes. And so the large expanse of land around the young city was comprised of untouched forest and fresh water. What would that have been like? Which animals would have made homes near those lakes? 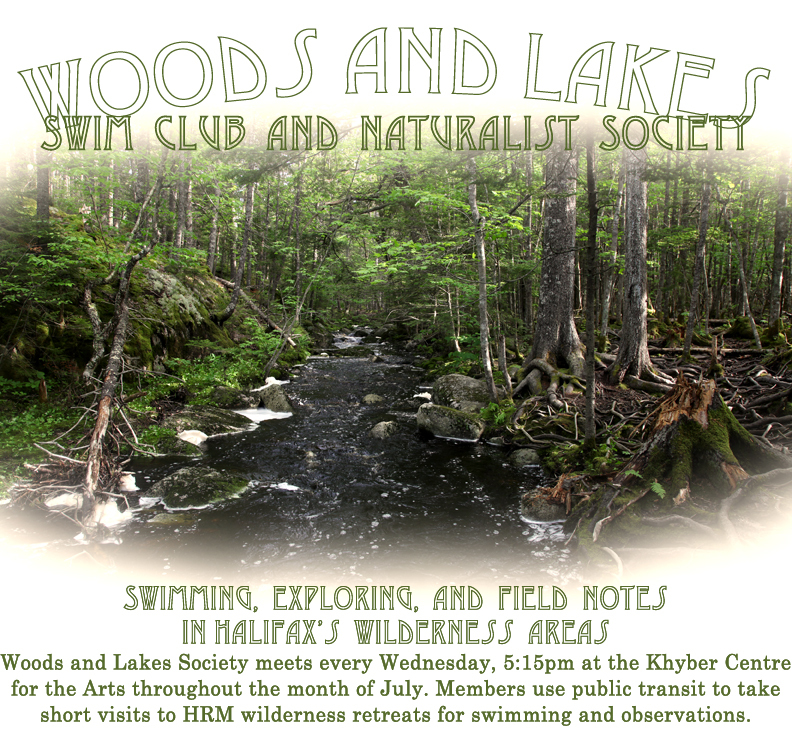 In an effort to learn more, I have begun a society called “The Woods and Lakes Swim Club and Naturalist Society”. Together, we will visit the lakes mentioned in the above map, in their present state. We will swim, we will consider our surroundings, and we will take notes. I have been searching through the provincial archives to find documents of the wilderness that used to be here, and of the animals who would have shared the city. 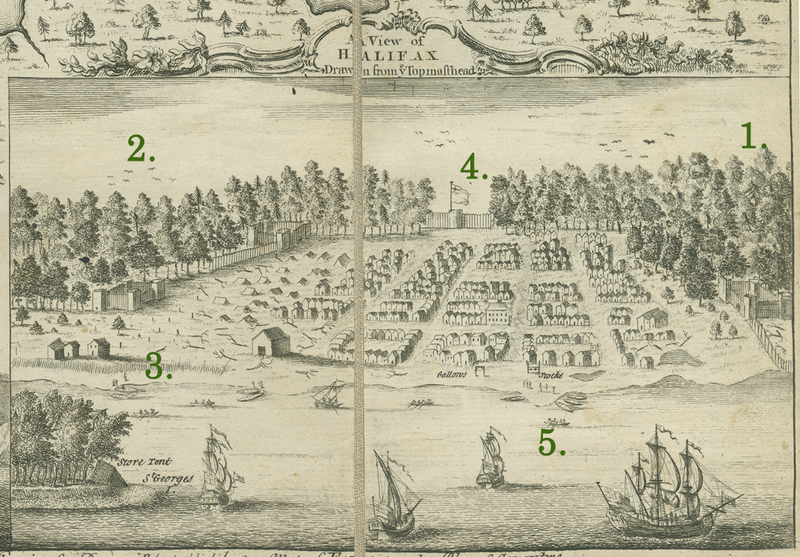 This early sketch of Halifax is particularly telling; it shows several blocks of houses protected by a fort, and flanked by the forest. The trees are huge — they tower over the buildings. Note the many branches left behind— they are sometimes larger than the tents. The forest was apparently cleared quickly. The fort walls seem to protect the young city from the forest— although there are still gaps in the walls that would have allowed animals to frequent the new streets. 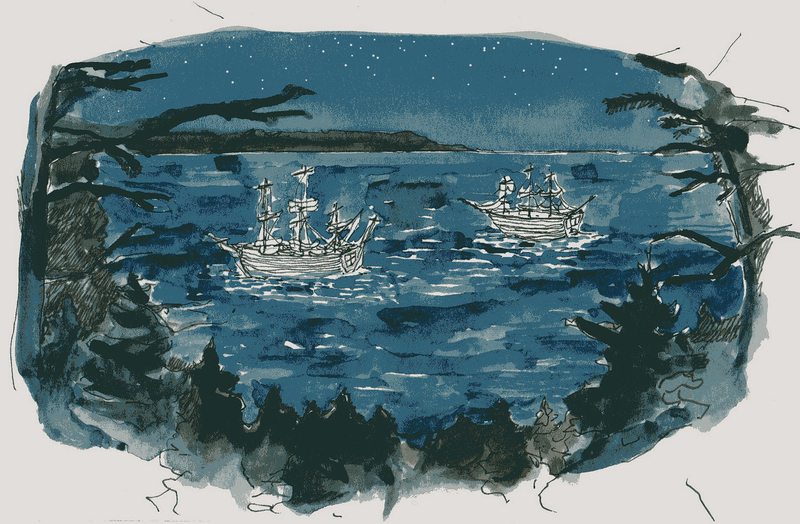 Sailors arriving in the early days would sometimes row back to their ships at night, to sleep away from the imposing woods and the creatures who lived there. 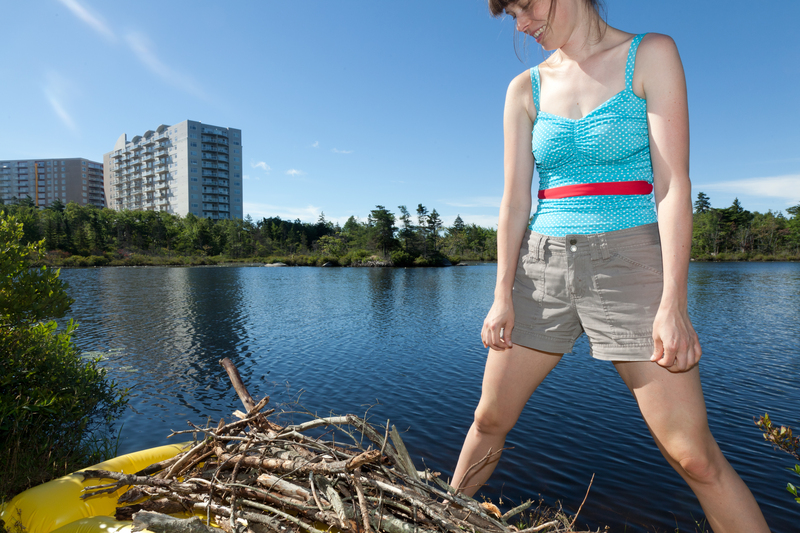 A fleeting moment in the history of Halifax, in which the city stood beside a great wilderness and citizens shared their home with wildlife.